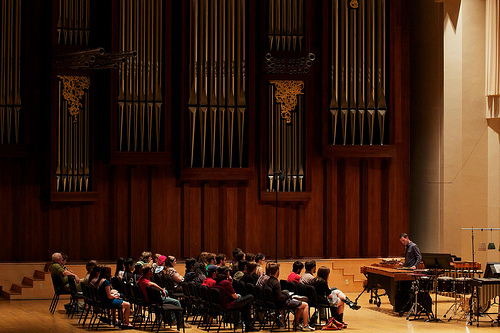 TODD MEEHAN currently serves as Associate Professor of Percussion at the Baylor University School of Music. He joined the faculty in 2003 and was recently honored with Baylor University’s 2010-2011 Outstanding Faculty Award in Teaching. His performance endeavors are focused on the creation of new music for percussion. In this capacity he has commissioned works from Paul Lansky, David Lang, Charles Wuorinen, Tristan Perich, Alejandro Viñao, John Supko, Matt McBane, and Jonathan Leshnoff, among many others, and has presented numerous premieres for solo and chamber percussion. In 2006 Todd co-founded the Meehan/ Perkins Duo with percussionist Doug Perkins. Since its inception the Duo has performed at Weill Recital Hall at Carnegie Hall, the Bang on a Can Marathon, the Ojai Music Festival, the Yellow Barn Music Festival, Monadnock Music, the Stone, and the International Festival-Institute at Round Top, in addition to performing and teaching master classes at universities and conservatories throughout the country and abroad. The Duo’s collaborative New World Records release with the Baylor Percussion Group entitled Restless, Tactless, Endless – Johanna Beyer and the Birth of American Percussion Music, was called “an engaging experience” by Gramophone and “immaculately played by the duo” by BBC Music Magazine. Their second album, Travel Diary, was released on Bridge Records in November 2011 and features commissioned works by David Lang and Paul Lansky, as well as electro-acoustic works by Tristan Perich and Nathan Davis. The Duo’s most recent release (2015) entitled Parallels features Tristan Perich’s epic 51-minute work for tuned triangles, hi-hats, and 4 channel 1-bit electronics.